When Days become Memories and Photos are the Portal to the Past. 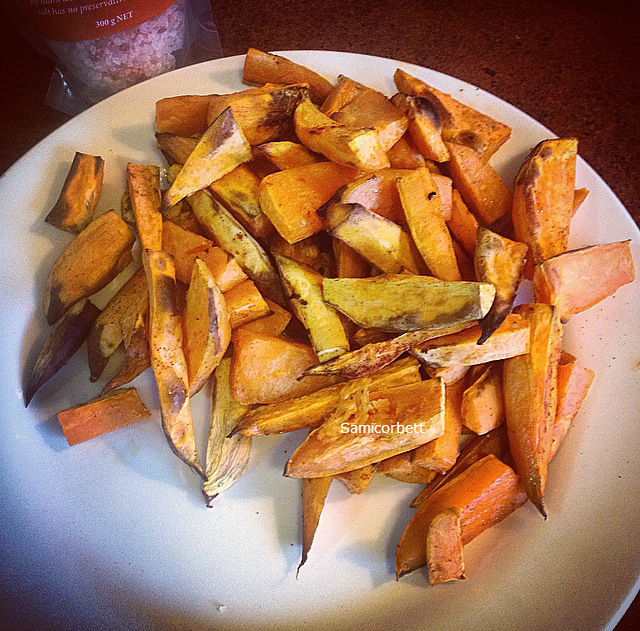 Sweet Potato Fries, Coconut Oil, Himalayan Rock Salt and a little Sweet Paprika. 1. They are high in vitamin B6. Vitamin B6 helps reduce the chemical homocysteine in our bodies. Homocysteine has been linked with degenerative diseases, including heart attacks. Also the Vitamin A content is enormous! Yay! Sweet potatoes were found to contain between 100-1,600 micrograms of vitamin A in every 3.5 ounces—enough, on average, to meet 35% of all vitamin A needs, and in many cases enough to meet over 90% of vitamin A needs (from this single food alone). 2. They are a good source of vitamin C. While most people know that vitamin C is important to help ward off cold and flu viruses, few people are aware that this crucial vitamin plays an important role in bone and tooth formation, digestion, and blood cell formation. It helps accelerate wound healing, produces collagen which helps maintain skin’s youthful elasticity, and is essential to helping us cope with stress. It even appears to help protect our body against toxins that may be linked to cancer. 3. They contain Vitamin D which is critical for immune system and overall health at this time of year. Both a vitamin and a hormone, vitamin D is primarily made in our bodies as a result of getting adequate sunlight. You may have heard about seasonal effective disorder (or SAD, as it is also called), which is linked to inadequate sunlight and therefore a vitamin D deficiency. Vitamin D plays an important role in our energy levels, moods, and helps to build healthy bones, heart, nerves, skin, and teeth, and it supports the thyroid gland. 4. Sweet potatoes contain iron. Most people are aware that we need the mineral iron to have adequate energy, but iron plays other important roles in our body, including red and white blood cell production, resistance to stress, proper immune functioning, and the metabolizing of protein, among other things. 5. Sweet potatoes are a good source of magnesium, which is the relaxation and anti-stress mineral. Magnesium is necessary for healthy artery, blood, bone, heart, muscle, and nerve function, yet experts estimate that approximately 80 percent of the population in North America may be deficient in this important mineral. 8. Their rich orange color indicates that they are high in carotenoids like beta carotene and other carotenoids, which is the precursor to vitamin A in your body. Carotenoids help strengthen our eyesight and boost our immunity to disease, they are powerful antioxidants that help ward off cancer and protect against the effects of aging. ← The Sea is where I Belong. The Sea is where I Belong. samicorbett on Carb Overload and Food Comas. Edibles&Travels on Carb Overload and Food Comas. Me, Myself and I, Face to the Blog.